I (Irina Beloozerova) suggest that you browse at least 1-2 of our papers while paying close attention to the Methods section. Free links can be found here. This will answer many questions about how our data was collected. 1) We recorded from chronically implanted awake freely behaving cats. Cats were trained to either walk in a chamber or a treadmill, or balance on a tilting platform. Dimensions of those devices can be found in our published papers, and are also described in one of the next tabs. Critically important information on HOW we trained cats to walk and balance can be found in the book of Karen Pryor “Lads before the wind” (first edition is best). We used “clicker training”. My guidelines to my students are here. 2) Behavior markers such as passing through a corridor, steps, body tilts, etc., were recorded using electromechanical sensors. They are described in detail here. In some experiments, we recorded electromyographyc activity (EMGs) of limb muscles. In some experiments, we recorded three-dimensional position of selected body points such as limb joints, back, the head, etc. using Visualyez (PTI). 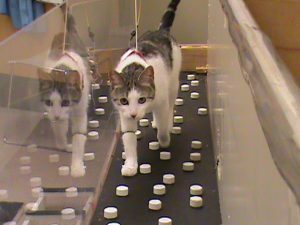 In some experiments, as the cat walked, we recorded movement of its left eye using an eye-coil electrode, coupled with a miniature magnetic field emitter positioned on the cat’s head (Rivers et al., 2014). 3) We used a unique head implant. Its latest description can be found in Prilutsky et al., 2005. This implant allowed us to use multiple movable micro-electrodes positioned in different brain areas simultaneously. Most data were recorded using one single electrode at a time. Recordings from different brain structures were usually obtained from the same subject, but usually on separate days. A number of simultaneous recordings from different brain structures are available, however. 4) We used FHC electrodes or Thomas Recording electrodes. See our comments on electrodes in one of the next tabs. We used custom pre-amplification. It is described here. 5) We used Spike2 (CED, UK) to control experimental devices, record data, monitor data collection, “cluster” spikes, and preliminary analyze data. My comments on spike clustering can be found in one of the next tabs. It is critically important for interpretation of the data that you understand clustering. 6) We used custom Matlab code to analyse the relationship of neuronal spiking activity with strides. The code can be found in one of the next tabs. Read Methods section of the papers below first, then, if still needed, read Methods in other papers, or contact Irina Beloozerova using the link on the top of the page. All tasks that cats performed during our experiments are described in great detail in the published papers. Below are summaries and specific references. Ladder with moving rung. The ladders with a pre-displacable crosspiece were identical to the ladders with stationary crosspieces except rung #7, as counted from the perspective of the cat walking along the ladder, that was attached to a motor. The motor and the pulley were positioned in-between crosspieces # 5 and #7, but were below the level of the crosspieces. In experiments with these ladders, cats were only rewarded with food for walking along the ladders in the direction that resulted in the movable rung to be #7 on the path, and they nearly always did so. 1) Most of our recordings were obtained using single-unit tungsten varnish-insulated electrodes. Before the year 2000, we manufactured them in the lab, and I am happy to share my knowledge with anybody interested. Now, however, I recommend that you save your time and buy electrodes. At least some of commercially available electrodes are of a decent quality and are cheaper than your time. Since year 2000, we used single-unit tungsten varnish-insulated electrodes from FHC. Not all FHC electrodes that we tried were good for our purposes, but eventually we learned how to order electrodes that work well for recording of the activity of large and medium size neurons in the freely behaving cat. There is one thing that is important to note here: the impedance that FHC lists (position 7) is not practically correct. These electrode are not 13-15 MΩ, functionally, they are like 1-2 MΩ. I never actually measured their technical impedance, because the FHC impedancemeter that we bought in 2005 or so was totally useless. It passed way too much current, so in seconds, electrodes impedance would drop to 100-200 KΩ, and they would behave as such in the brain. So I’ve stopped measuring, and just kept buying electrodes with higher and higher stated impedance until they were good for our experiments. These electrodes have somewhat fragile tips. If you bump the tip against your hand, chances are that you have ruined the electrode. These electrodes would survive only a certain number of insertions into the brain through a thin to modest layer of connective tissue and pia matter, like 3-4 insertions. We changed the electrodes often. They had, however, a much better ability to penetrate connective tissue than the glass electrodes that are described below. 2) We recorded smaller neurons, such as cortico-thalamic projection neurons of layer 6 and cortico-cortical projection neurons using platinum (95%)+tungsten (5%) electrodes insulated with quartz glass. In 2000, we purchased $2000 worth of 40 μm glass filament from Thomas Recording, the smallest volume they would sell at that time, pulled some the filaments to fine tips using their puller (a friend had one in his lab), and sharpened the electrodes on a home-made diamond grinder. Now almost 20 years later, we still have most of the filament. We only pulled two times so far, while visiting that friend’s laboratory. One does need a special puller to pull quartz glass. On each visit, one person (IB) spent about a week to work out the regimen and then pull enough electrodes to last next ~10 years. Grinding was not of any particular difficulty and did not take much time (15-20 min per electrode). There electrodes are practically indestructible, I mean, in careful and experienced hands. We used some of them for months in everyday experiments. The most typical way to loose such electrode is to drop it on the floor and fail to find. These electrodes minimally damage the tissue, so that neurons on a track can be still recorded after a good number of passages with the electrode, and often same neurons can be identified and recorded on multiple days. The drawbacks are: (i) these electrodes would penetrate only a thin layer of connective tissue, and (ii) they bend rather easily, so they would only travel without any significant deviation from the intended track for ~5 mm. We have also used electrodes made from 80 μm filament, but they did not offer any appreciable advantage over 40 μm ones (were still hard to see and feel), while making twice as large tracks in the tissue. Description of HOW we used the electrodes with our manual home made drives on our cat head implant can be found here. Collision test determines if a response of a neuron is antidromic, i.e., the neuron responds because its axon is stimulated. Top trace, a pyramidal tract projecting neurons (PTN) spontaneously discharges (arrow 1), and pyramidal tract is stimulated ∼2 ms later (arrow 2). PTN responds with a latency of ∼1 ms (arrow 3). Bottom trace, PTN spontaneously discharges (arrow 1) and pyramidal tract is stimulated less than 1 ms later (arrow 2). PTN does not respond (arrow 3) because in less than 1 ms its spontaneous spike was still en route to pyramidal tract, and thus collision/nullification of spontaneous and evoked spikes occurred. From Karayannidou et al. 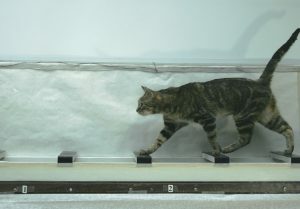 Activity of pyramidal tract neurons in the cat during standing and walking on an inclined plane. Journal of Physiology (London), 587, 3795–3811, 2009. Bishop PO, Burke W, Davis R. The identification of single units in central visual pathways. Journal of Physiology (London), 162, 409-431, 1962. Fuller JH, Schlag J. Determination of antidromic excitation by the collision test: problems of interpretation. Brain Research, 122, 283-298, 1976. NOTE: It is critically important for excitation of thin axons that the DENSITY of the current is high. Sufficiently high current density is achieved by passing it between small closely positioned electrodes. See explanations in e.g., Swadlow HA. J. Neurosci Methods., 79(2): 131-141, 1998. We typically used 120 μm wires in Teflon insulation that had 0.4 mm exposed tips; we positioned the tips 1-1.2 mm apart. NOTE: the insulation MUST be good, to not “leak”. Classification of spikes as to be discharged by one, two, or more neurons is never 100% accurate. There are several reasons for this. First, spikes discharged by a neuron often differ in amplitude and shape. Most of the time, these differences are small, but in certain conditions, they are significant. For example, the amplitude and shape of the spike depend on the time passed since the previous spike; if it is small, the amplitude tends to diminish, while the duration of the spike tends to increase. Second, the amplitude and shape of the spike in the record first and foremost depends on the location of the neuron in respect to the electrode, not on the neuron’s firing properties. The amplitude and shape of the spike also of course depend on filtering and amplification of the signal. For neurons recorded on the same channel, those will be identical, but not necessarily so for neurons recorded on different channels or recorded during different sessions, please keep this in mind. Third, there is always electrical noise in the record, and it distorts the amplitude and shape of spikes making them even more variable. Fourth, spikes of many neurons are very similar to each other. Thus, It is practically impossible to tell between discharges of a single neuron and those of a couple of neighboring neurons by simply classifying waveforms (sorting spikes) from a record obtained in the absence of any stimuli, no matter how versatile the classification is. During recording, move the electrodes around and see what happens to the amplitude of the spikes. Do they, at any position of the electrode, separate into a “big ones” and “small ones”? Or perhaps “big”, “medium” and “small”? Test during a behavior and evaluate: do the clusters that you see based on waveform analysis behave similarly or differently during a behavior. If they behave similarly, collapse them together; if they behave differently: think! Are they really produced by different neurons? Or, could it be that the cell simply starts its discharge with higher amplitude spikes followed by smaller spikes? Test during more than one behavior and evaluate: do the clusters that you see based on waveform analysis respond similarly or differently to the change in the task? If they do, and everything above was also similar about them, then this is probably all spikes of one neuron. If not, think! Cluster carefully, but set yourself a time limit for deciphering any particular record. Generally, an attempt to classify spikes in a record with a reasonable fairness should not take longer than going back to the lab and obtaining a clearer new record. Unless the record is very unique. Keep your overall research goal in mind. For some purposes, it might be better to leave out some spikes that belonged to the neuron in question, for other purposes it might be better to include some spikes that in fact probably did not belonged to it. Understand that spike sorting is never 100% accurate. Mind very much WHO did it, and for WHAT purpose. Is it always necessary to tell neurons apart? Well, I like it very much to be able to, but I can [reluctantly] agree that, for certain evaluations of brain activity, it might not be absolutely necessary, although some degree if neuronal specificity, in my opinion, is ALWAYS necessary.